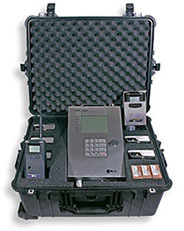 Wireless systems for atmospheric monitoring for chemical and compound detection use standard and proprietary wireless technologies to deliver reliable "always on" cable-free connections for fast, easy and flexible deployments. Wireless solutions provide proven long-term results, even in the harshest of environments, by combining battery-powered sensors and integrated radio-frequency (RF) technology operating over license-free frequency bands. 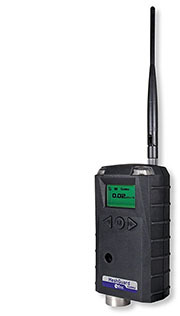 MeshGuard is a rugged, battery-powered toxic gas detector integrated with a wireless mesh radio modem. Key features include extremely fast installation, self-configuration of the network, and worldwide approved wireless frequency coverage. Designed for use in harsh environments and easy to service in the field, MeshGuard is a truly unique wireless solution for remote chemical detection in hazardous areas. 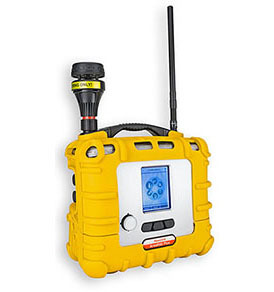 The AreaRAE Pro is a wireless, transportable area monitor that can simultaneously detect toxic and combustible gases, volatile organic compounds, radiation and meteorological factors. 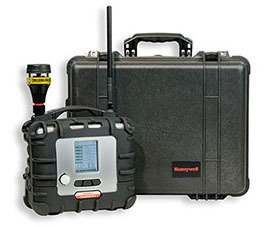 Whether you're carrying it into a hazmat response, setting up perimeter at a fire or protecting a public venue, the AreaRAE Pro works with Honeywell's remote monitoring software to give you a real-time view of threat readings so you can make real time decisions to ensure the safety of your teams and the general public. AreaRAE Plus is a wireless, transportable area monitor that can simultaneously detect toxic and combustible gases, volatile organic chemicals, and meteorological factors that affect the speed and direction of the gas. Whether you need to protect your community by monitoring a fence line, protect your employees during a maintenance turnaround, or protect your fire and hazmat team during emergency response, the AreaRAE Plus alerts you to threats with local audible and visual alarms. Plus, it works with Honeywell's remote monitoring software to give you a real-time view of threat readings from a safe location. ConneXt Pack-Confined Space is a turn-key, application-focused combination of wireless four-gas QRAE 3 monitors and an EchoView Host portable controller. An attendant, using the EchoView host, has full visibility into the readings of the gas monitor worn by the confined space entrant. By receiving detector readings and man-down alarms, the attendant can know what is happening in the confined space in real-time and respond in real-time to life safety events. 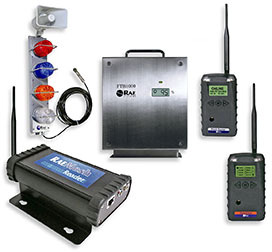 The EchoView Host mini-controller is the cornerstone of RAE Systems' Closed-Loop Wireless Solutions for portable gas monitors. This rugged handheld wireless device can establish a self-contained, self-sufficient network with up to eight supported RAE Systems portable wireless monitors (MultiRAE, QRAE 3 and ToxiRAE Pro family) and display their readings and alarm status in real-time on an easy-to-read screen. The RAE Systems MeshGuard Gamma radiation detection monitor is a key building block of the MeshGuard intelligent network of connected sensors for gamma radiation detection in industrial and environmental monitoring applications. The MeshGuard system is designed for quick deployment in areas where low cost/high ROI solutions are required. MeshGuard Gamma is available with field-replaceable pre-calibrated sensors specifically designed to sense gamma radiation. 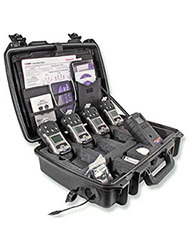 A variety of accessories are available for use with the MeshGuard wireless gas detection system. RAE Systems MeshGuard accessories support the mesh network by extending run times, providing greater transmission distances, and enhance monitoring capabilities. All detectors are certified for hazardous environments – Class I, Division 1 or Zone 0.